The candidate should have passed or appeared for the Intermediate Examination (Qualifying Exam) or its equivalent as decided by the DEECET Committee for appearing at the DEECET. However, he/she should have passed the qualifying examination at the time of admission. The candidates should have secured 50% of marks in aggregate in the Qualifying Examination for appearing in the DEECET for both ‘A’ and ‘B’ category seats. The minimum percentage of marks in the qualifying Examination for Scheduled Caste, Scheduled Tribe and Physically Challenged candidates shall however be 45% for both ‘A’ and ‘B’ category seats. Note: The candidates who passed Intermediate with Vocational Courses are not eligible. Candidates should have completed 17 years of age as on 1 September of the year of admission. There shall be no upper age limit for admission into D.El.Ed course. 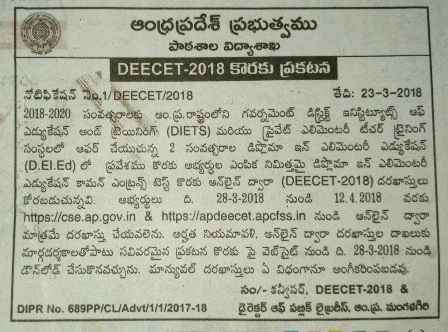 The candidate after satisfying herself/himself about the eligibility criteria for DEECET shall pay a fee of Rs.500/- through payment Gateway between 28.03.2018 to 12.04.2018 for submission of application through Online. The candidate has to give the required preliminary data (i.e. Name of the candidate, Date of birth, Gender, whether the candidate belongs to A.P. and mobile phone number). On receipt of fee through gateway the candidate shall be issued a ‘Journal Number’ with which she/he can proceed with submission of application online. Issue of Journal Number does not mean that the candidate has completed submission of application online. It is only a confirmation of the fee received. The candidates shall follow the procedure for submission of online application as given in the ‘Information Bulletin’ and user guide and instructions provided online while filling up the online application form. The Candidate should be ready with photograph of size 3.5X3.5cms before filling in on-line application. Paste the photograph on a white paper and sign below (sign in Black Ink only). Look for the sample at point 13 (iii), of the Information Bulletin. Ensure that the signature is within the box. Scan the required size containing the photograph and signature. Please do not scan the complete page. The entire image consisting of photo along with signature is required to be scanned and stored in *.jpeg format on local machine. Ensure that the size of the scanned image is not more than 50kb. If the size of the image is more than 50 kb, then adjust the settings of the scanner such as dpi resolutions, number of colours during the process of scanning.